Noticed Details | Lancaster County Timber Frames, Inc. Since the publication of Timber Frame Hybrids in 2008 a surprising number of those who have read the book have questioned me about my work with dogs. Some have even sought more information about my “vintage but cherry” Suzuki Titan motorcycle. Both of these details are mentioned only in the blurb under my photo at the end of the book. I knew that there were a ton of dog lovers out there but I had no clue that so many would have any interest in a 45 year old 2-stroke motorcycle. So, to satisfy anyone who has wondered but were too shy to ask, I’ll fill in some blanks. I’ll start with the dog thing. Growing up with seven of us in a barely 1,100 square foot rancher I knew instinctively not to pester my parents for a dog, though I wanted one badly. At an early age our black & white television introduced me to “The Adventures of Rin-Tin-Tin”. Set in the Old West at Fort Apache the series focused on the relationship of a young boy who had been rescued and adopted by the soldiers and his German Shepard (later in life I discovered that Rin-Tin-Tin was an anachronism. That breed did not exist before 1899 which was after the time setting of this series). I believe I watched each and every episode for the full five seasons it ran. As Rin-Tin-Tin was a German Shepard my focus, in all its youthful intensity, was on that breed. I knew full well that I would need to defer gratification until I was on my own. Twenty years ago I watched a Sunday afternoon local animal program entitled “Call of the Outdoors”. 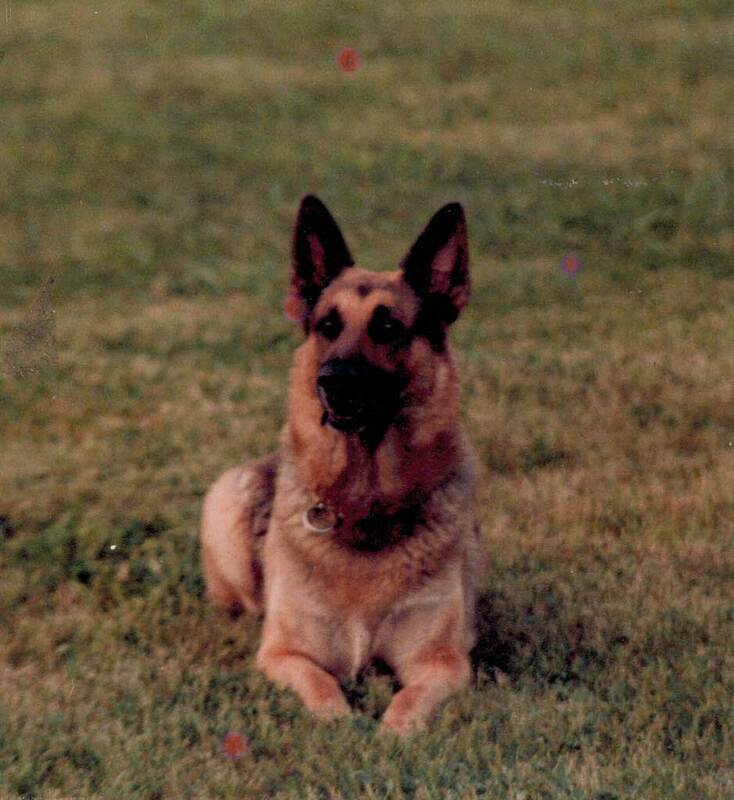 The subject that weekend was a German Shepard Dog named “Blitz”, who along with his owner, Bob Drescher, performed tasks that surpassed anything I had ever witnessed. I spent the rest of the day trying to contact Drescher. 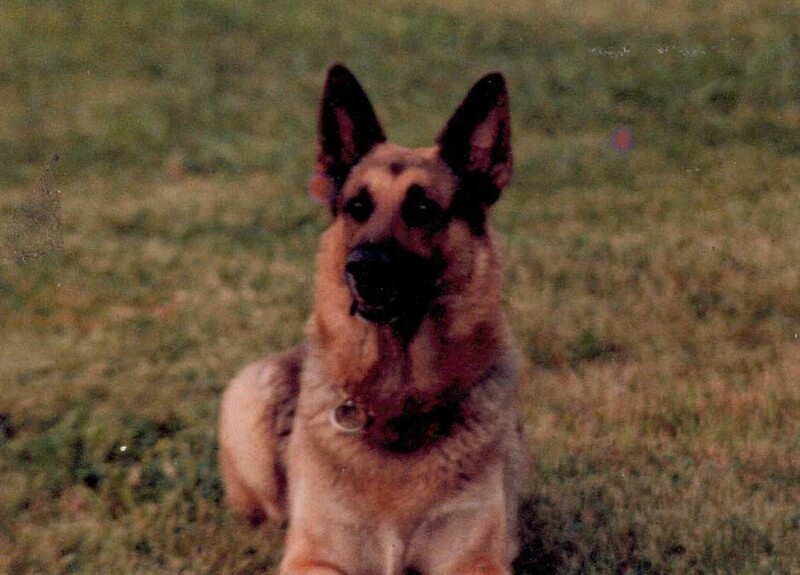 The following evening I was able to get his wife on the phone and explained to her that I wanted a dog like Blitz. I’m sure they had dealt with a number of similar calls after the broadcast as she was a bit curt, ‘You’ll need to devote at least a year or two of free time and invest at least $6,000 in training and lessons plus the cost of a good puppy”. I remember that figure clearly because it was within a couple of hundred dollars of my teaching salary that year. I told her that I would get the money. Fifteen minutes later Bob called me back and we talked for several hours. Very long story to a very short one, Bob helped me select a puppy, taught me as much as I could absorb about dogs and guided me in developing that puppy into an incredible animal. Bob never charged me a dime and for the past forty years we have been like brothers. Together, along with Blitz and Ragnar, we presented numerous demonstrations for civic groups, schools, police departments and government agencies. Bob and I performed research on dog bites for the U.S. 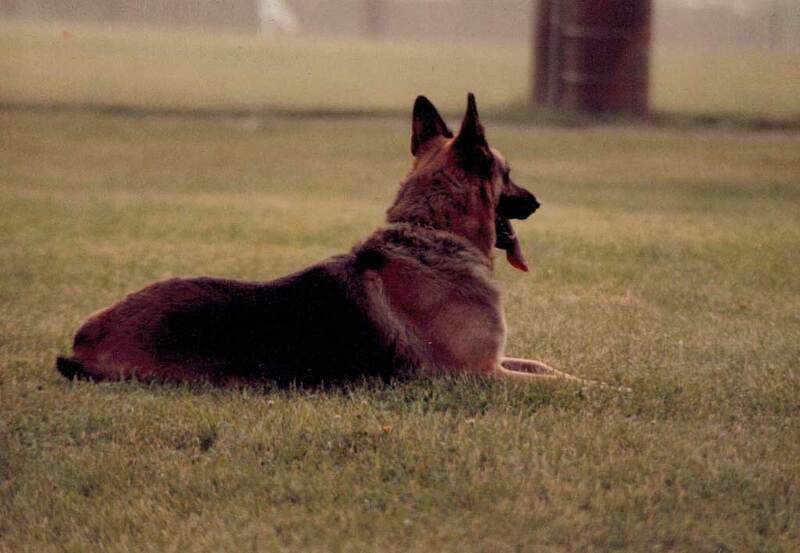 Postal System, set up and maintained a four unit canine team for the Lancaster County Prison (the SOP’s, Standard Operating Procedures, we developed for this prison were, within a decade, adopted by correctional institutions in numerous states). We also helped police departments in narcotic detection. And for about four years I was a Contributing Editor at DogSports Magazine. One day Blitz died. Six years later Ragnar did the same and I left the dog world, but not dogs: we have two miniature dachshunds, and male and a female, both whom have me well-trained. The following is a reprint of one of my pieces for Dog Sport magazine. I’m one of the lucky ones. I’ve turned my master around. It wasn’t easy and I almost didn’t pull it off. My dilemma was a perplexing one. I’m 10 years old. The last two years have, most definitely, not been my best. I’m not talking about the physical infirmities of old age, I’m referring to a loss of interaction and attention. My master wasn’t abusing or even mistreating me. It was just that I was no longer his best friend. He had been leaving me at home a lot and didn’t seem to have much time for me anymore. But, he always had time for everyone else’s dog. All the time in the world for other dogs, but little for me. But he was my master and on a moment’s notice I’ve worked my heart out for him. He wouldn’t work me months on end and then, suddenly, he’d use me to demonstrate to audiences or clients “his” abilities. Months of nothing and the he’d expect me to work like a machine (one of his favorite phrases). He must have noticed that of late I had begun to delay just a second or two before going to his rescue on handle protection situations. I should have just let the agitator beat some sense into his thick skull. But I couldn’t give up on him. I’m glad I didn’t, because I was able to wake him up before it was too late. We met when I was three months old. We both knew that it was the start of a great adventure. I was his first dog, and he had looked hard and waited long for me. I was the center of his world. But I certainly didn’t make it easy for him. I was full of myself and life. He had a lot to prove to me and I fought him tooth and nail almost every foot of the way until I was sure that he was deserving. He became obsessed. He read and watched and questioned and through and grasped. He went to training sessions, matches and shows. He tried to absorb everything about me, about dogs. I saw him through many phases. I was with him in obedience, Schutzhund, and conformation. I gave him a wall of ribbons and rosettes, and a shelf of trophies. And a four-point major. We were inseparable. Because of his love and insatiable to know and to understand, I took him places he didn’t know existed. I explained things to him that he had never before fathomed. I showed him how to see and feel and think with parts of hi s mind that were weak and unused, if not long dead. I wasn’t the most perfect of dogs. I had my faults. But I surely gave him a standard by which to measure others. In point of fact, I corrected a goodly number of his weakness in the years that followed. And I enhanced his strengths. Together we grew. But then, two years ago it began to change. He began to ignore me. He began doing things without me. He worked with groups of dogs, with agencies and departments of dogs. Weeknights and weekends. I would not have minded if he had just a little energy left for me. If he had just worked me a little, even those circus tricks that he felt were beneath my dignity, I would have been happy. But instead, I was becoming a piece of furniture. I began to age, to grow old. I didn’t move with the same fluidity I had when I was younger. Also, I did get tired sooner. And I did have my share of stiffness and pain. But I as only aware of the ravages of time when I felt useless and unloved. I had hoped that the change in the my master was temporary. I had hoped that he’d once again have time for me. But as weeks became months, I began to lose hope. While passing time, I began to ponder the reasons for the change that I didn’t not understand. I knew that he had become very busy, but I also began to realize that this explanation was only a small factor in the scheme of things. And I knew that he was still as proud of me as ever, so being ashamed of me wasn’t even a small factor. No, there was something more, clues that I saw and felt but couldn’t name. Try as I did, I could not isolate or identify the reasons for the change. Late into an autumn night several months back, the answers began to unfold for me and for him. I was asleep by the side of his bed. Apparently I began to slip deeply into dream and then into nightmare. My breathing must have been terribly erratic. Also, it must have been terribly loud, as it woke my master. For the second time in my life I saw him out of control. Again I saw in his face that same look that I had seen once before so many years ago when Blitz and I play King of the Mountain. What I saw in his face was fear, ,total and abject. Once again, he thought I was going to die. And then I began to understand. And with that understanding came a sorrow for him and for all those other masters and trainers who, in the last part of their primary dog’s life, distance themselves from their dog. I am sure that the reason and excused for such distancing are many and varied. But I wonder how many trainers find that young puppy with whom they develop a very special and rare bond and then, in that dog’s last years, diminish, knowingly or unknowingly, that bond for the very same reason my master did ours. Maybe my master’s reason is not common, but in the context of what we, and others like us, are to one another, I do not think his reason is unique. My master caught it in time; I hope others do also. My master had had a number of other dogs while I have been with him and he’ll have others after I’m gone. But I cannot be forgotten. Never again will he invest so much time, energy, hope and raw enthusiasm in a dog. Never again will he learn as much from a dog. Never again will he feel for a dog as he felt for me. I am his one experience that cannot be repeated. I think he knew this and I think that this was the reason for the change in him that began almost two years ago when he first began to see the tell-tale sign of my aging. He was trying to put distance between us because of his fear of the inevitable. He had begun to fear my death and had tried to ensure his emotional survival. Fool.